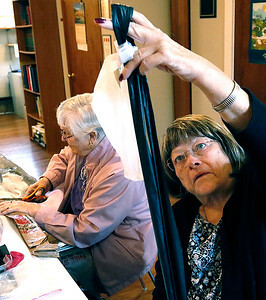 H. Rick Bamman - hbamman@shawmedia.com Bag Ladies Doris Christy (cq) (left) cuts plastic grocery bags as Jill Fox measures a plastic link while assembling 5-by-7-foot and 2 inch thick crochet sleeping mats for the county's homeless population. H. Rick Bamman - hbamman@shawmedia.com One of the 5-by-7-feet and 2 inch thick crocheted sleeping mats created by The Bag Ladies. 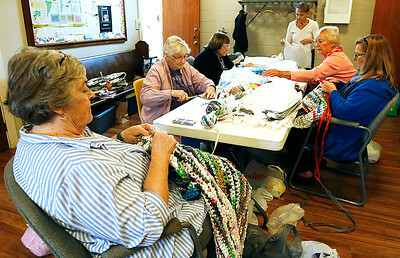 Agroup women who meet every Tuesday to crochet to distribute to the county's homeless populations. 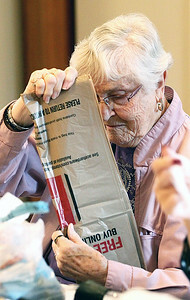 H. Rick Bamman - hbamman@shawmedia.com Bag Ladies Doris Cristy cuts plastic grocery bags as Jill Fox measures a plastic link while assembling 5-by-7-feet and 2 inch thick crochet sleeping mats for the county's homeless population. 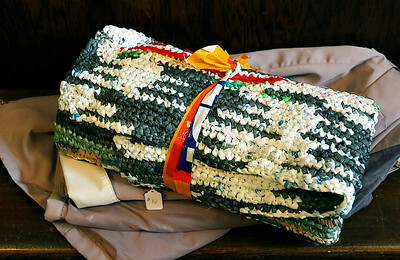 H. Rick Bamman - hbamman@shawmedia.com A finished sleeping mat made out of old grocery bags complete with a plastic bow is ready for delivery. 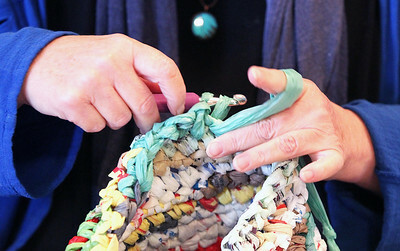 H. Rick Bamman - hbamman@shawmedia.com Bag Lady Doris Christy (cq) sorts old grocery bags for a project that crochets them into sleeping mats for the homeless. 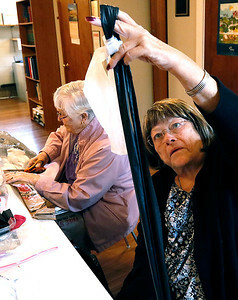 H. Rick Bamman - hbamman@shawmedia.com Ringwood United Methodist Church Pastor Lori Bee crochets old grocery bags Tuesday, Oct. 11, 2016 into a 5-by-7-feet and 2 inches thick sleeping mat. 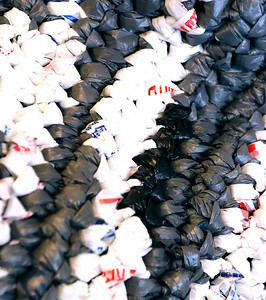 A finished sleeping mat made out of old grocery bags complete with a plastic bow is ready for delivery.